You are here: Home / Dome / Where to Camp? Previous Post: Dome with Cover! The dome will be in the walk-in area, to avoid the noise, congestion, and dust of the main camping area. I’m bringing a 4-foot by 7-foot garden cart to allow easy transportation of equipment from the road to the camp. But now the question is, just where in the walk-in area should we be? 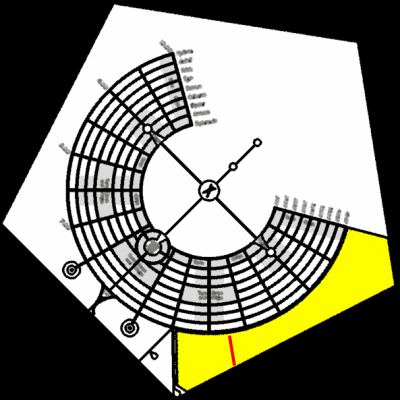 Here’s a diagram of Black Rock City, with North pointing up and the walk-in area in yellow. 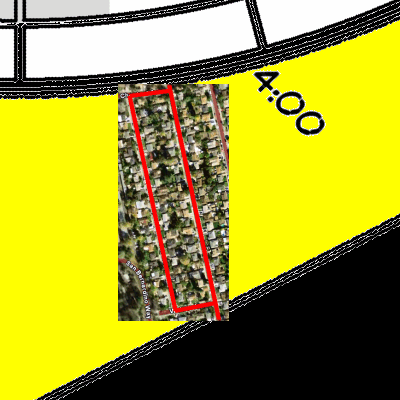 I’ve put a red line on the diagram that indicates the size of a particular pair of roads in Sunnyvale California that I’m familiar with. This line is 1/4 mile long. Being about 2/3 of the way down the red line is one possibility for the camp location. The wide road at the top of the diagram has a lot of traffic, and the rest of Black Rock City is North of that. The road at the bottom has only occasional traffic, being a service/security road. The airport runway is about 1/4 mile South of the service road. Another possibility is locating to the right on the other side of 4:00, again, about 2/3 of the way down the line. In either case, we want to be upwind of the porta-potties, which probably are at 3:30.